Don't let this ugly exterior fool you. The InterContinental Hotel is much nicer inside. 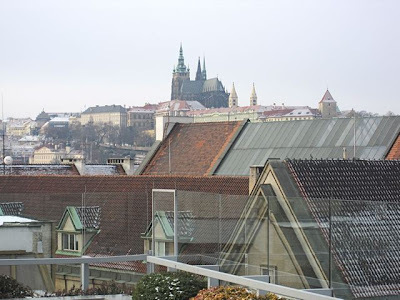 Last week, V took me for brunch at the hotel's restaurant, Zlatá Praha (Golden Prague). Years ago, we used to be hotel brunch regulars, hitting all the big ones. But prices and times have changed, and we don't do it much anymore. 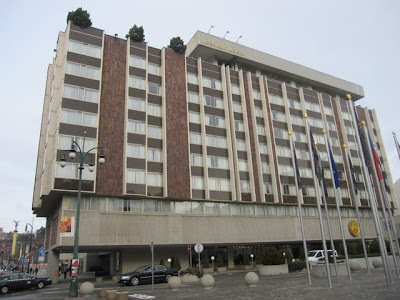 We always considered the best to be the one at what is now known as the Radisson Blu Alcron . I wrote about it almost two years ago. The price there is now 1099 CZK and includes unlimited wine, beer, and a welcome glass of sparkling wine. That brunch focused on excellent, freshly prepared seafood. Our past experience with Zlatá Praha was that the food wasn't as good, but the atmosphere in the dining room was much better. 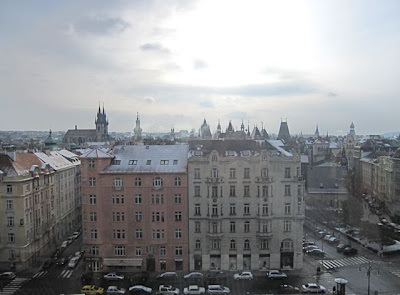 And the view of Prague's Old Town could not be beat. A spot by one of the big picture windows is a front row seat for beautiful buildings like Old Town Square's Týn Church. 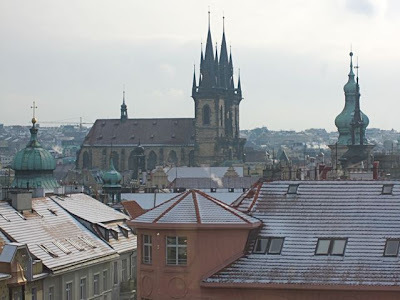 Of course, Prague is known as the city of 100 spires (or 1000, depending on whom you ask). You can see quite a few from here. We received mimosas on our arrival, and then the Bohemia Sekt started flowing. 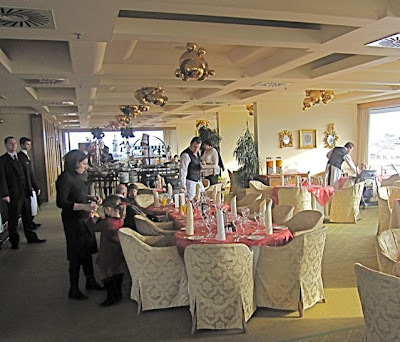 Zlatá Praha's Sunday brunch was 990 CZK per person. 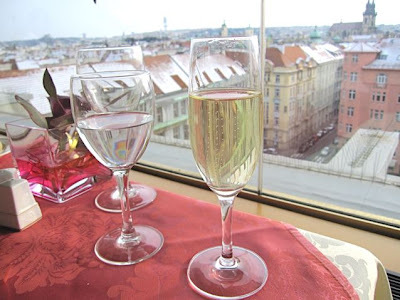 But free-flowing wine and sparkling wine was 350 CZK per person extra. And that's for the cheap stuff, Bohemia Sekt. For better quality French champagne, it was 500 CZK extra per person. As for food, there was a gourmet à la carte menu to go along with the standard buffet service. 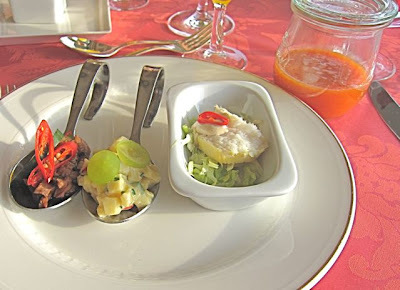 I started at the buffet table with some amuse bouche-style items. I had a large spoon with sliced roast beef with sliced chili pepper. The meat was good, with a tangy flavor we both thought was ketchup. There was a spoon with a cheese cube salad, which was OK. And there was small dish with a slice of smoked butterfish over undressed lettuce. This was plain unpleasant. The fish had a desiccated, mealy texture. Behind the plate, I had a lidded jar containing gazpacho. It tasted more like plain tomato juice, with only a hint of pepper. It was boring and bland. 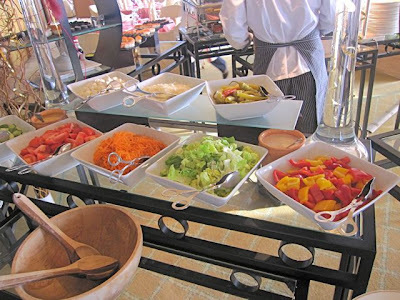 There was a salad bar with mostly basic choices. You could mix your own lettuce, tomato, peppers, cucumbers and dressings, but not too much more. I then went for the table with limited sushi offerings. I tried one of each type they had available -- tuna and salmon nigiri and maki. If this sushi were served to me anywhere, I'd consider it bad. But at a first class hotel, I considered it shockingly bad. The chef cut the raw fish in ugly, jagged little pieces. Even worse, all the flesh was wrinkled from dryness. The rice under the nigiri was crunchy and freezing cold. The maki was even worse. Yet, the tuna and salmon did not taste old or spoiled. My conclusion: The sushi had likely been made long before the brunch and then stored in an industrial-strength refrigerator. Talk about disrespecting the fish. Frankly, the mall sushi at Makakiko Asia and Sushi Restaurant in the Palladium is far superior. In more positive buffet news, raw oysters were available. This is one of V's favorites, and she liked these. I think she had a dozen, making two trips to the table. I moved on to the à la carte menu. You can order as much as you want from this. The first thing I had was the Eggs Benedict. I'd call it not bad, but still sub-par. 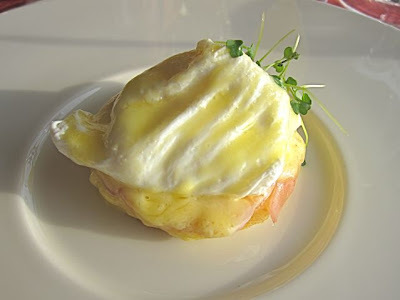 The egg, itself, was perfectly poached. The Hollandaise sauce was thin. The ham was a very ordinary, thin cold cut slice. And the English muffin was more like a round circle of bread. From there, things improved. 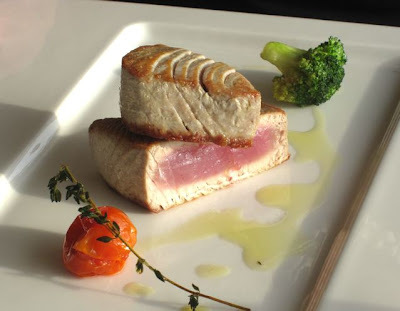 I tried the seared tuna with sesame sauce. It was a medium-size, very fresh tuna steak. I prefer it very red, so it was cooked a little more than I like. The exterior had a nice salt-sesame flavor. But there really was no sauce. Just sesame oil. By itself, I found it too dull. I kicked myself as I was finishing it for not going over to the sushi table and picking up more soy sauce and wasabi. 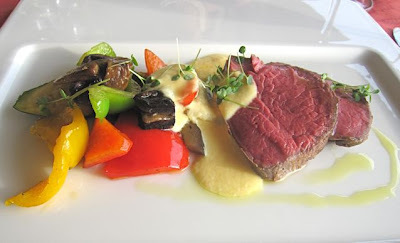 Then, I got the beef tenderloin with grilled vegetables. Unlike the sushi, this warm meat was very red and rare from top to bottom. It could have been more tender, but the flavor was nice. I liked it. It came with a sauce that was remarkably like that which came with the Eggs Benedict. The grilled vegetables were well-prepared. But I wished for less red and green peppers and more of the other stuff, like the mushrooms. The last thing I ordered was the veal roast beef with what the menu, in Czech, called "chocolate salt." This was the winning dish of the day. 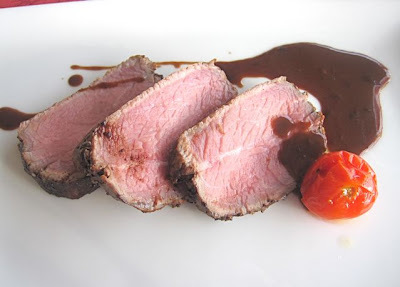 The absolutely delicious, very tender meat came with a salty, chocolate-based sauce that was like a very rich gravy. I think they meant "sauce" on the menu, rather than "salt," but no matter. I wished I had room for several portions. However, it was time for dessert. 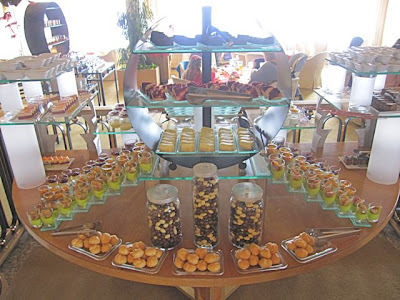 They had impressive displays of a multitude of cakes and pastries, along with the usual warm chocolate fountain with fruit. I picked up a small crème brûlée and a chocolate mousse. V got glasses with pistachio cream topped with baked apple, and also one with fruit and vanilla cream. The crème brûlée and a chocolate mousse were disasters. Both were old, tired, and dried out. The crème brûlée's sugar top had gone soft and merged with the sugar-gritty bottom. The mousse had a chalky texture and an off-taste that we, veteran mousse-makers, could not identify. V's choices were better. The green cream had a very enjoyable, rich flavor that reminded me of the great pistachio crème brûlée at La Finestra in Cucina. The other was more like a standard crème brûlée, but fresh-tasting. We finished our second bottle of Bohemia Sekt just to feel like we got value from the 700 CZK surcharge, and we were done. My assessment was that if food is the first priority, I'd go to the Radisson Blu for brunch every time. 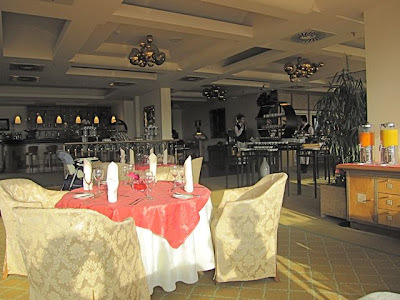 The food was far superior, and their 1099 CZK price includes unlimited beer and wine. 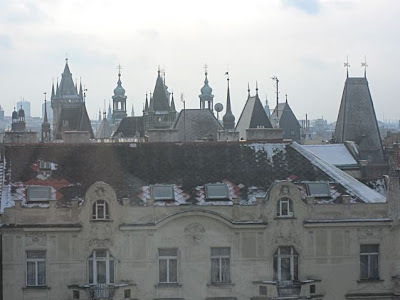 At the InterContinental, for 1380 CZK a head, you get unlimited wine, fantastic views, and the serious possibility you are going to eat something unpleasant. Even so, you might be surprised to hear me say I'd still consider taking out-town-guests there. They'd most certainly be wowed by the scenery. I'd just have to steer them carefully away from the many disappointing dishes. 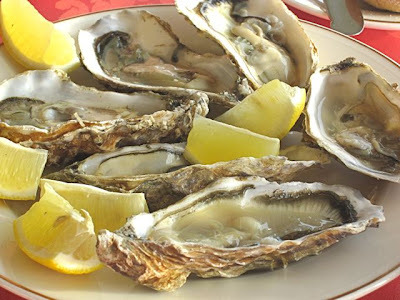 I'm sure we could be happy with just oysters and the à la carte items. So, it could be a memorable meal for a visitor, in spite of the problems. But if I ever find myself going up the InterContinental hotel's elevator again, I'll be counting the floors, thinking of the Bryan Miller Rule. And I'll be dreaming about the dining room at the Radisson Blu. Which is on the ground floor, by the way. 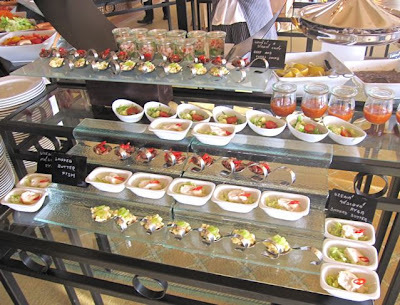 You should try the brunch at Hilton city center, I actually prefer it to the Radisson. Fabulous shrimps, we visited the buffet 3 times to get more!! I am sushi suplier for Intercontinental Hotel. 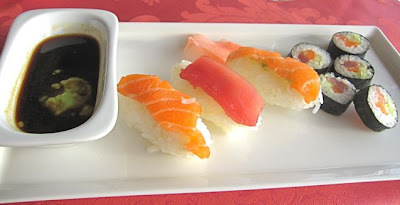 The sushi that you tasted came from previous suplier, but the headcheff wasn´t happy with the quality (same as you) so they stopped taking the sushi from them and now only take sushi from us - sushiqueen.cz. The sushi is made fresh right before the brunch, ones a month right on the spot. So please give the sushi at the brunch another chance, I am sure you will be happy with it.